As most of you know, I am not much of a fiction reader. Yes, I have reviewed fiction books in the past, but they are a struggle for me. One reason is sometimes the author takes a great number of chapters to get to the main point. Other times is when I put a book down don't come back to it, I might get lost as to where we are in the story. Most fiction books are original stories that the author wants to share to his readers. Matt Carter and Aaron Ivey have presented a different kind of fiction for their readers. 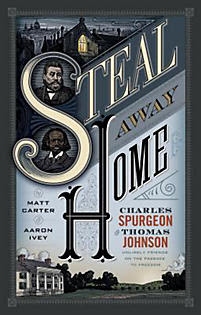 Their book, Steal Away Home, is actually a historical fiction story based in the account of a real life friendship between Charles Spurgeon and Thomas Johnson. Most of us know Spurgeon as the popular British pastor in the 19th century who has many books over the years still read by most Christians. A great majority of people have no idea who Thomas Johnson is. Johnson was an African-American slave for 28 years, who was set free then became a missionary. Carter and Ivey got the idea of writing a book like this after Carter read a book that was historical based on a true event. Carter and Ivey spent many years researching everything they have written. According to an interview with Equipping You In Grace, it took them three years to write this book. Carter and Ivey write about the early days of both Johnson and Spurgeon and the circumstances on how they met which eventually, led to their friendship. The details of history is captured in a way you would think you were reading a documentary as the events of the book were unfolding. Carter and Ivey have given us a book which is unique in the Christian book industry. I am hoping for more books like Steal Away Home in the near future. Thanks B&H Publishing for letting me review this book.